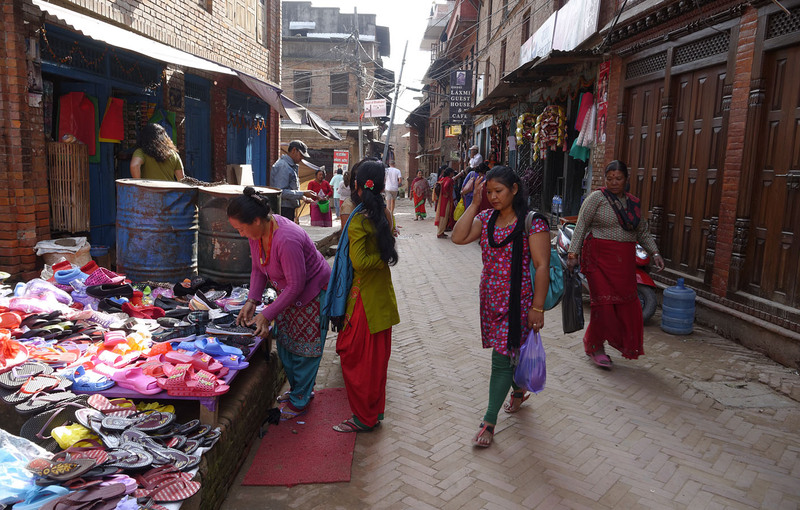 This is the main street in Bhaktapur, Nepal, home to hundreds of small shops. 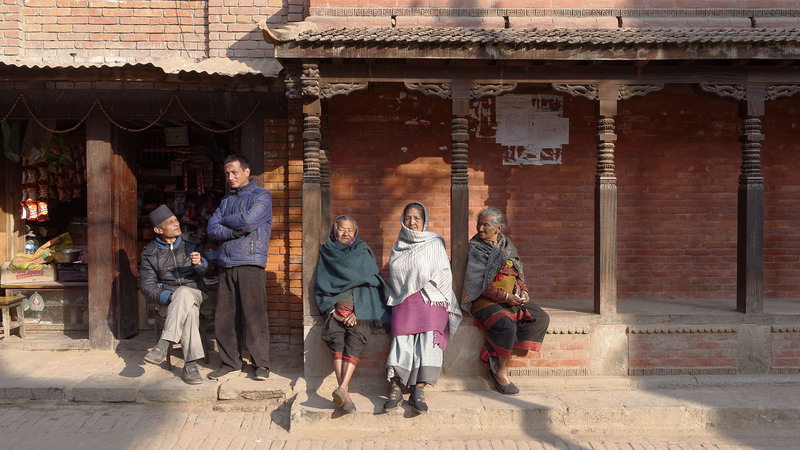 This issue's photo essay, a retrospective look at Bhaktapur, Nepal, includes photographs taken by myself and members of my staff between 2013 and 2016. This retrospective, like many, is a look through rose-colored glasses. 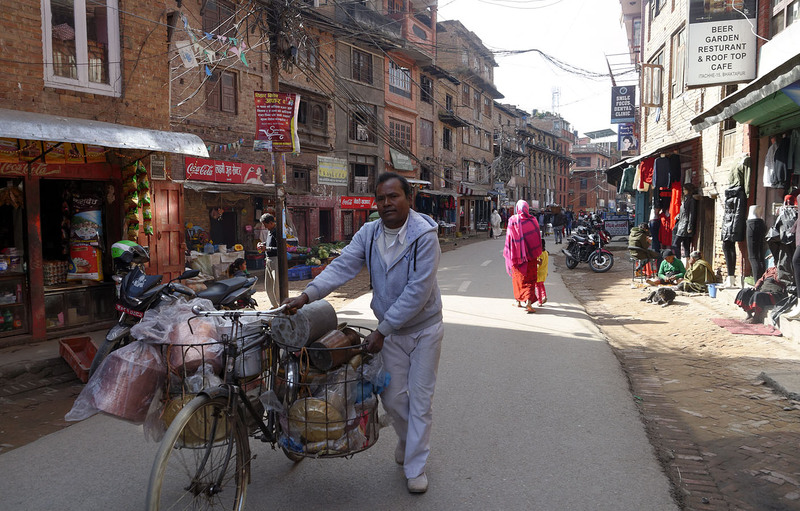 There are almost no motorcycles and few signs of the devastating earthquake that struck Nepal in April, 2015. 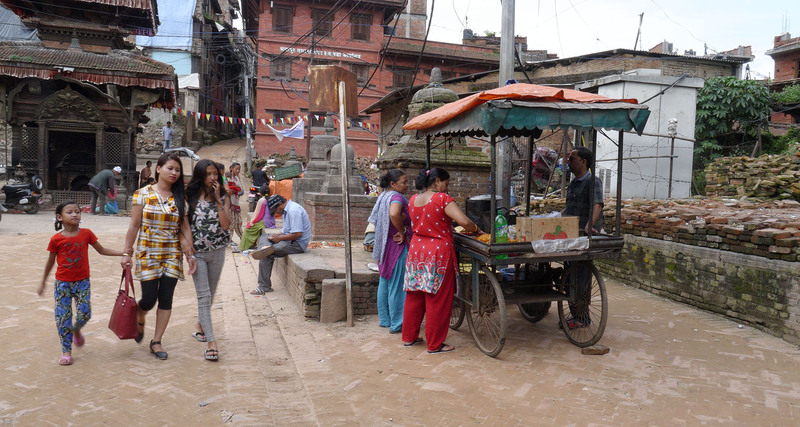 It's the way I would like to remember Bhaktapur, not the way it was when I left. It is my fondest hope that someday it will again look like it does here. Click on an image to open a bigger version in a new tab. Ctrl+w will close the new tab and return you to Carfree Times. Socializing in public spaces is a daily activity. that bring light and air into the adjacent houses. 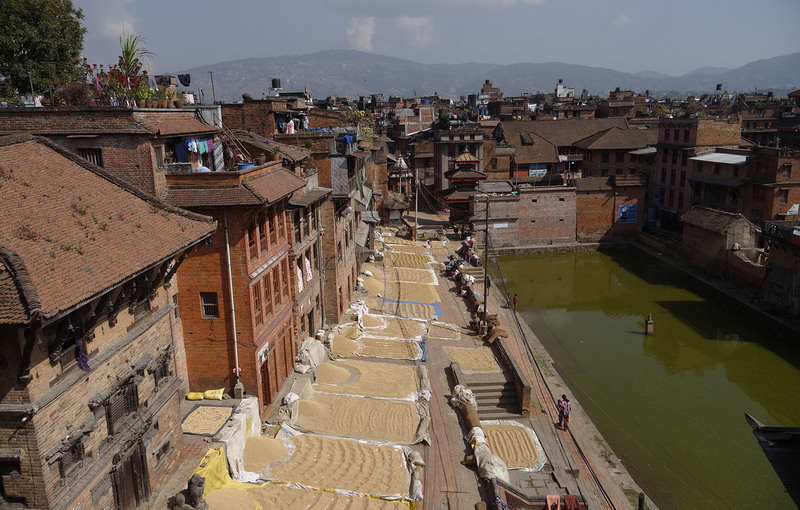 Grain drying in the autumn sun is a reassuring sight. are used for many purposes. Shop fronts spill out into the street during business hours. The bicycle is still a mainstay of local freight delivery. 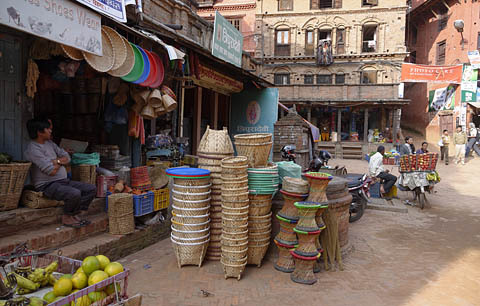 southern Nepal, there are a lot of them. you can buy it here, right where it's made. 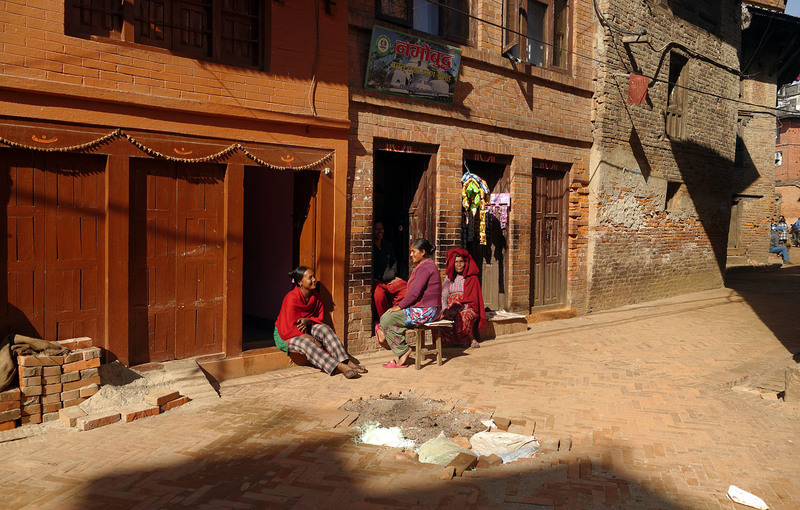 There's always time for a chat with friends and neighbors. Nobody has much money, but most things are cheap. but is mostly used for things that must be waterproof. Temples are everywhere. In fact, most houses have one. You barely notice them after a while. 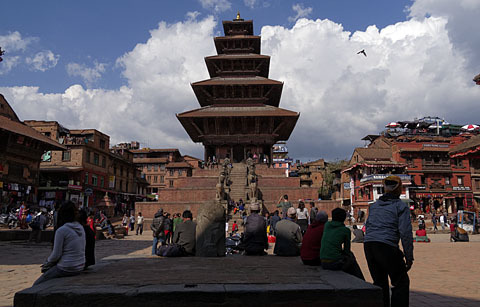 Nyatapola is the only five-story pagoda in Nepal. summer with its heavy monsoon rains. Bhaktapur's Durbar (Royal) Square before the earthquake. Most kids walk to school. from one of the social spaces. social spaces can be seen. of their culture this way. 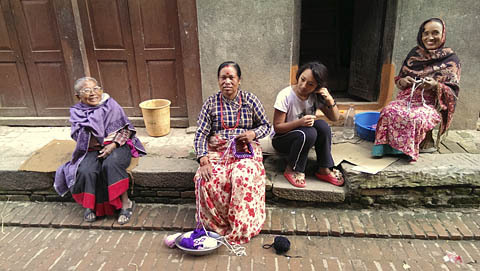 Making beads and selling them. Many different games are played in the streets. 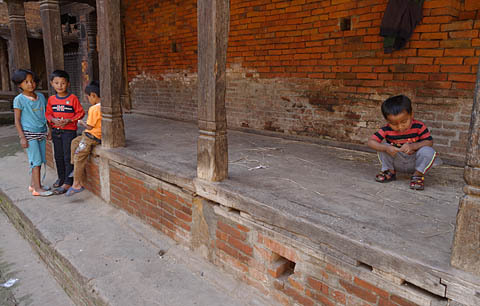 Another temple with well-used steps and ledges. 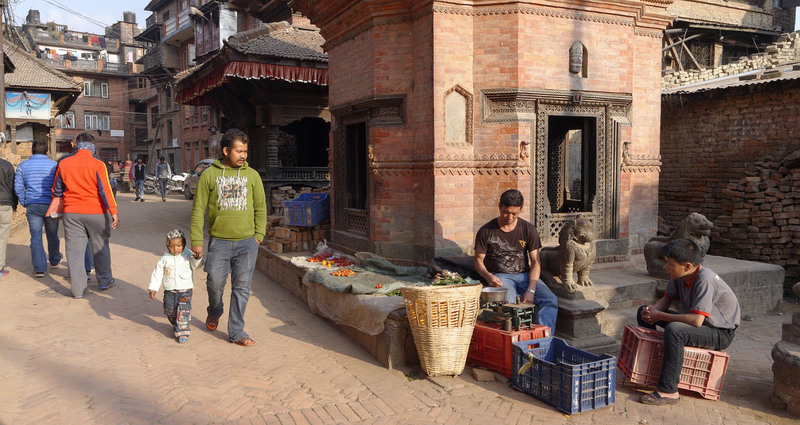 Commerce mixes freely with religion. Fresh greens, picked just hours ago. their turn at the temple. 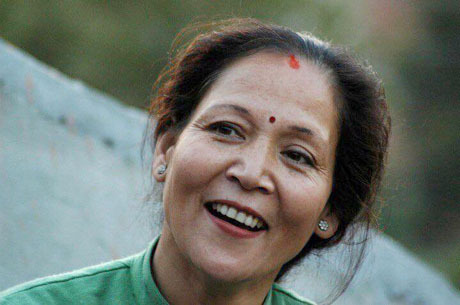 Indira Bijukchhe was 49 and the wife of Raja Man Bijukchhe, a good friend of mine in Bhaktapur. They were riding a motorscooter which was hit by a truck. Raja is recovering from his injuries. I offer my condolences to the family for this tragic loss. This issue is dedicated to her memory. The Conversions page at Carfree.com has been fairly extensively updated. This seems to be a good moment to look back on three personally significant events of the past sixteen years. 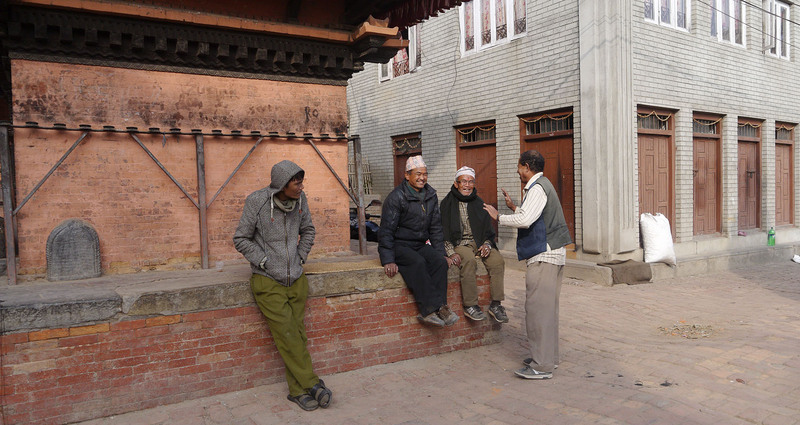 Just two days before his wife was killed and he was seriously injured, Raja Man Bijukchhe urged me to write my recollections of the roughly 1000 days I spent in Bhaktapur, Nepal. This task is rendered more poignant by the tragedy that occurred so soon afterwards. 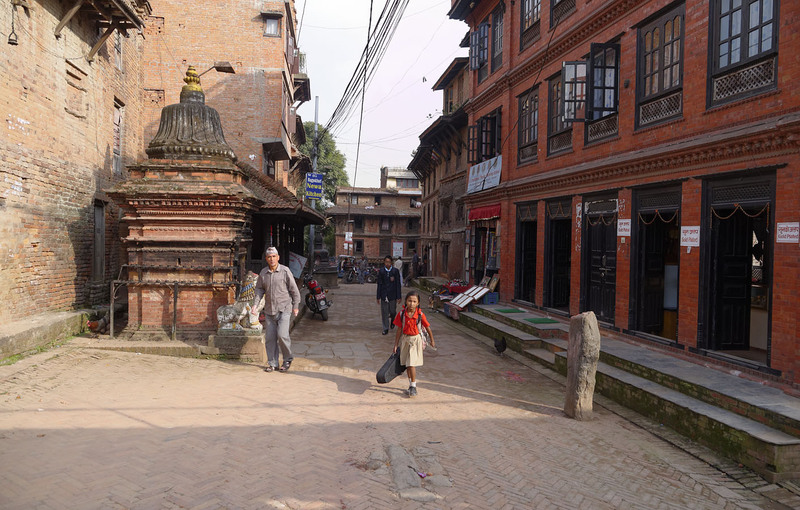 I first arrived in Nepal in late October, 2013, and proceeded directly to Bhaktapur from the airport. I spent nearly all of the following three years in Bhaktapur, leaving it only for a few relatively brief trips outside Nepal and one short visit to the Nepali city of Pokhara. 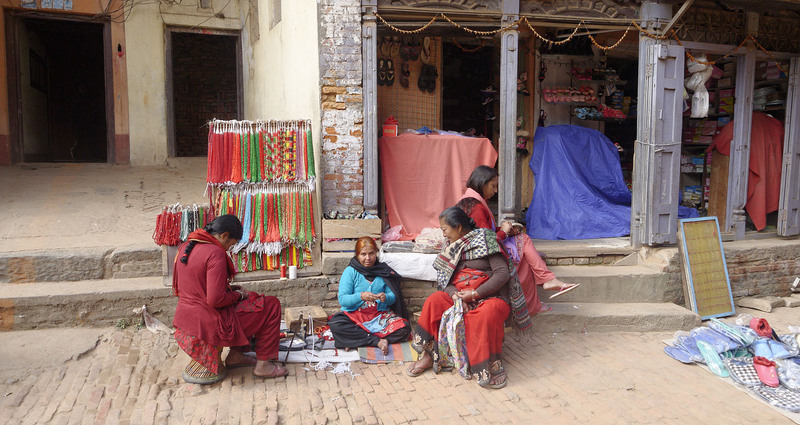 Despite having spent three years in Nepal, I have seen little of the nation outside the Kathmandu Valley. 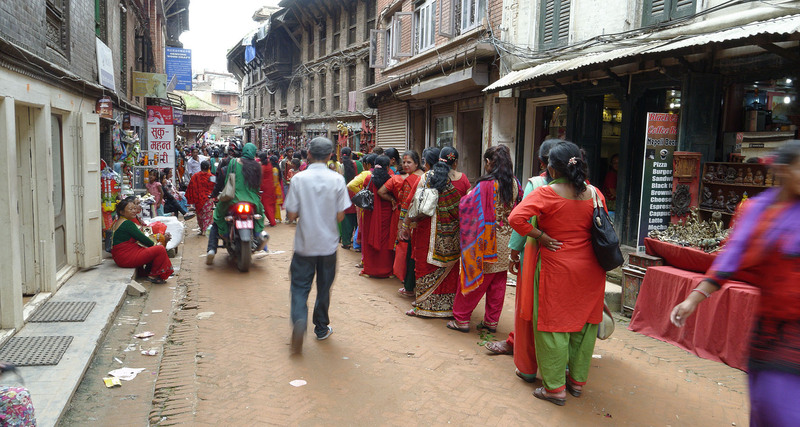 The Kathmandu Valley is in fact a paradise on earth, or at least it once was. The Valley is the bed of a former lake which appears to have drained naturally during human memory, leaving behind a very thick accumulation of rich, silty soil. The Valley is about 1400 meters above sea level, so it is nowhere near as hot as the Gangetic Plain that lies less than 100 kilometers to the south. It is surrounded on all sides by high hills, and the snow-capped Himalayas are (or used to be) frequently visible from the Valley. This remarkable geographical condition is the source of both problems and gifts. 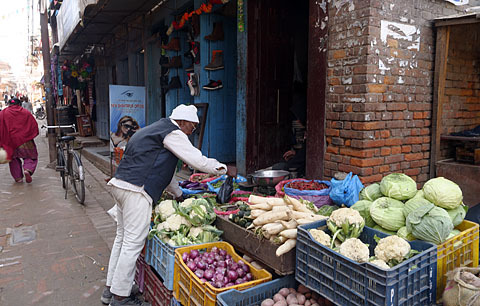 The rich soil, combined with reliable monsoon rains, makes the entire Valley a highly productive agricultural area, and most crops can be grown there. 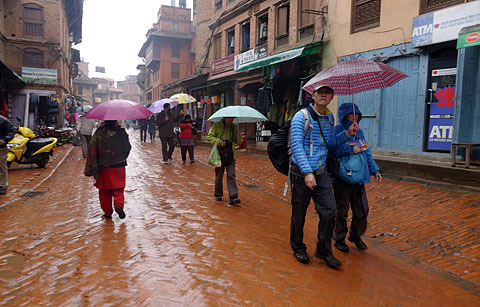 The weather is quite temperate, although nights can dip to freezing in the coldest part of the winter. It never snows. However, the very soft soils make the Valley highly vulnerable to the major earthquakes that shake the region about once a century. 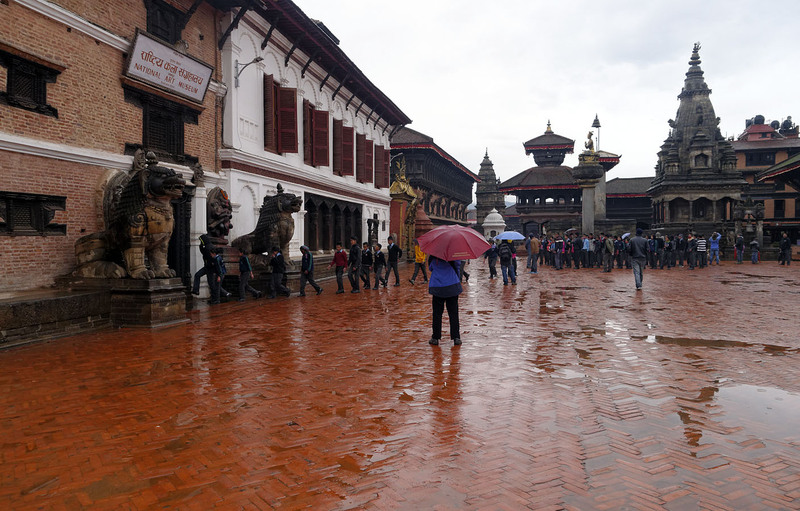 I was there for the magnitude 7.8 earthquake that struck on 25 April 2015. That earthquake caused about 9,000 deaths and the damage or destruction of countless buildings across much of Nepal, including a large number of culturally important structures. 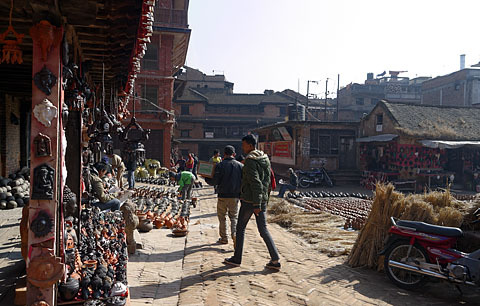 Bhaktapur itself was one of the hardest-hit areas. The city of Sankhu, only about 15 kilometers to the northeast, was all but destroyed during the earthquake and the magnitude 7.3 aftershock that followed 16 days later. 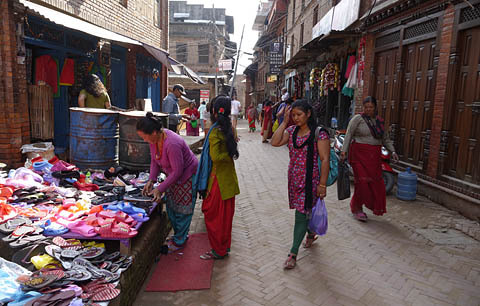 The earthquakes were followed a few months later by an economic blockade imposed by India in retaliation for Nepal's adoption of a constitution that India did not like. This resulted in great hardship for most of the people of Nepal, which only eased when the blockade was relaxed after about four months. 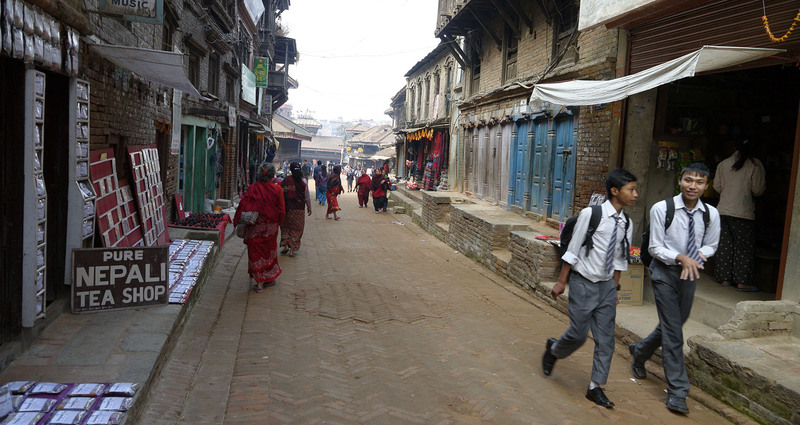 It is thus apparent that this was not an easy time to be living in Nepal. Despite these difficulties, I have no regrets about having lived there for a long stretch, and I miss the place and most particularly the many people I came to know there. It is worth looking at the various ways in which Bhaktapur is such an agreeable place to live, as well as the threats to its generally high quality of life. 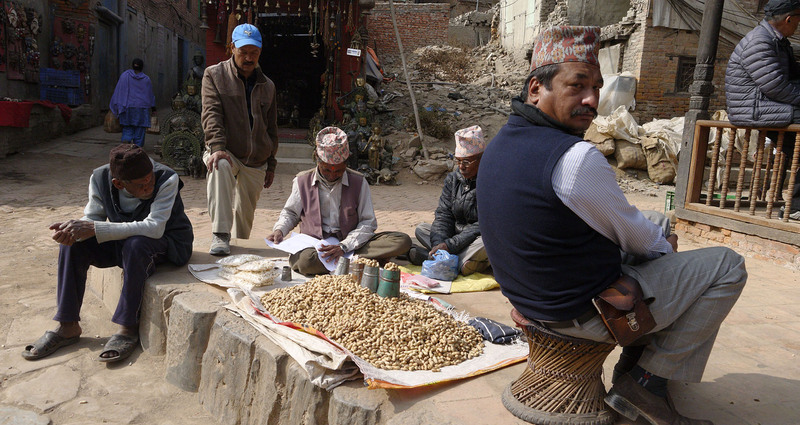 Nepal is a poor nation, with a per-capita GDP of less than $1000. 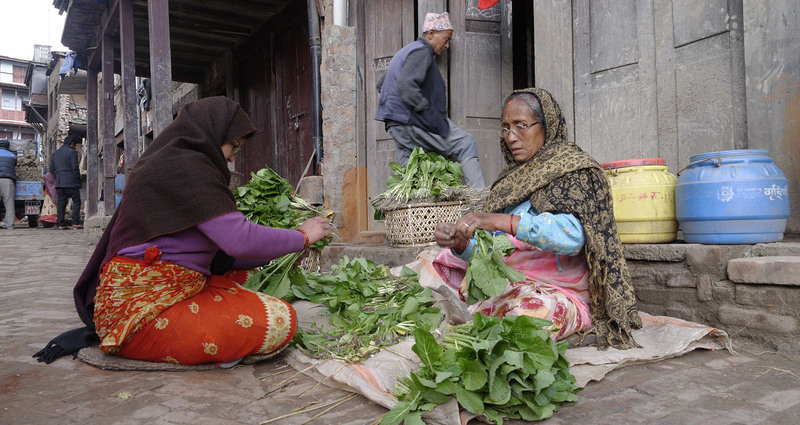 The reality is not quite as harsh as that number would suggest, and not many people in Nepal go hungry. Living conditions are basic but not primitive, and both healthcare and education are better than in many similarly poor nations. What really changes the picture, however, is the richness of social life, at least in the parts of Nepal that I have seen. It is true that all the common human vices are to be found in Nepal, but in terms of social life, of all the other places I have visited, only Bali can rival the Kathmandu Valley for its strong social life. In both places it happens that the culture is founded on the Hindu religion, although the expression is quite different. In Bhaktapur as in Bali, if you live somewhere for a few months, you will come across many people who recognize you and will greet you as you pass. 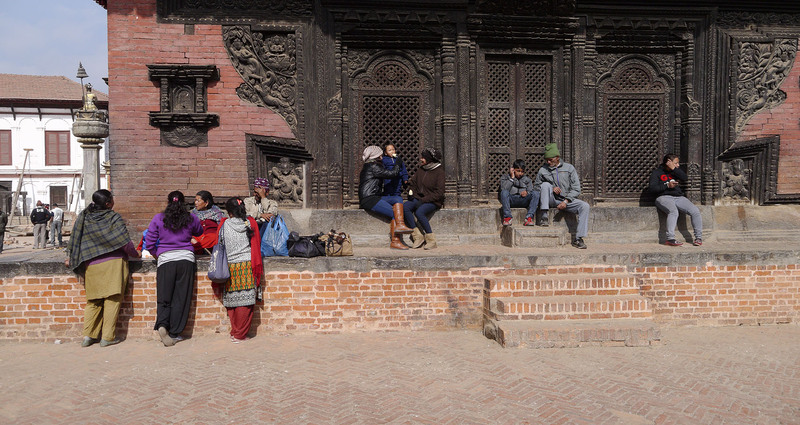 It would be foolish to pretend that human affairs in Nepal are somehow idyllic. There was a civil war that ended only ten years ago and cost the lives of more than 10,000 people. The chief of the anti-corruption agency is defending himself against . . . corruption charges. 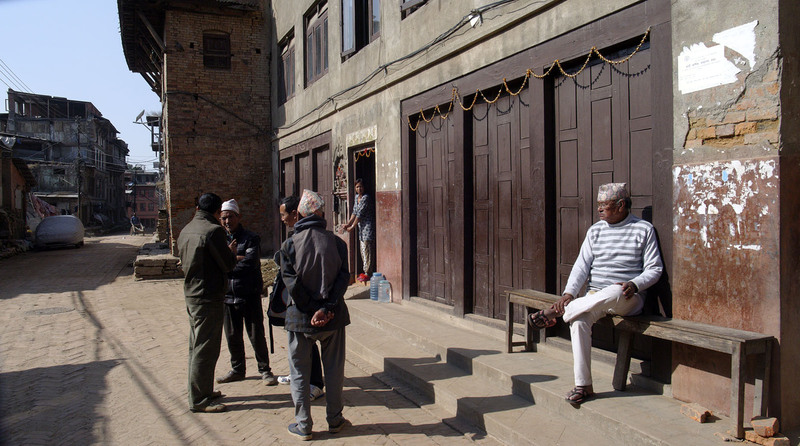 The caste system was officially terminated but still governs much of daily life. In many cases, people feel their family obligations as a prison. Alcohol causes serious problems. 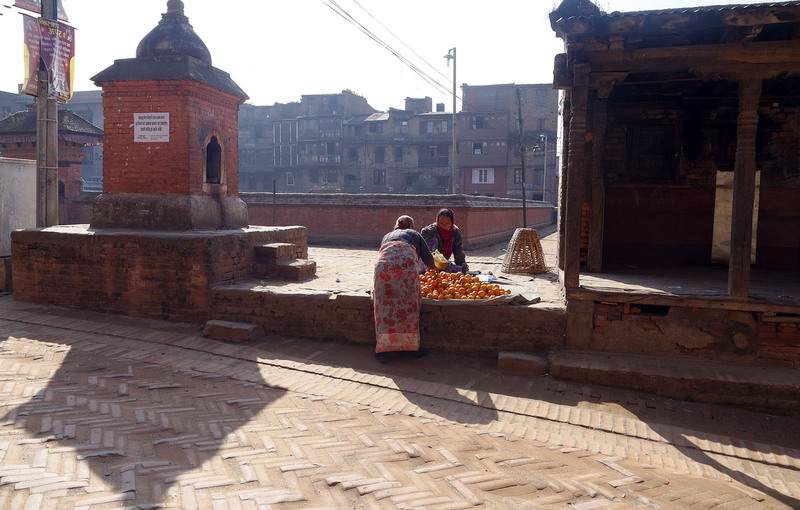 All this notwithstanding, I miss Bhaktapur. 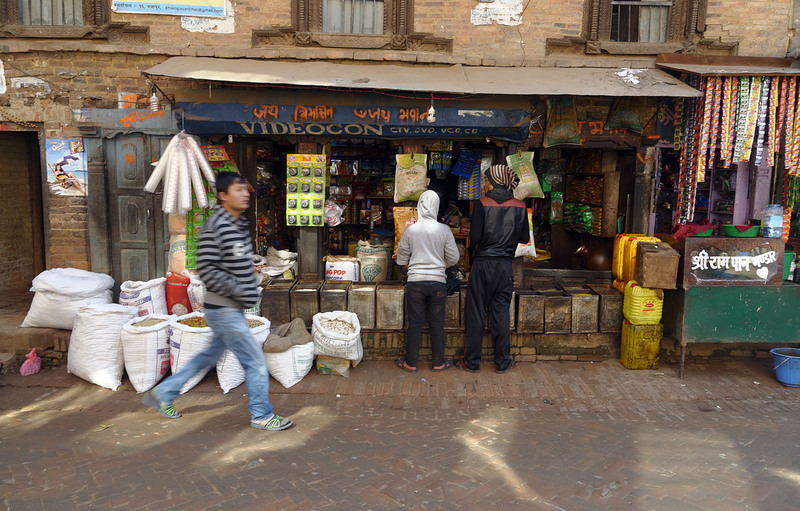 I don't miss the air pollution, which is what finally drove me to leave, and I don't miss the day-to-day difficulties such as load shedding [regular electricity cuts], shortages of cooking gas, and sometimes even water shortages. 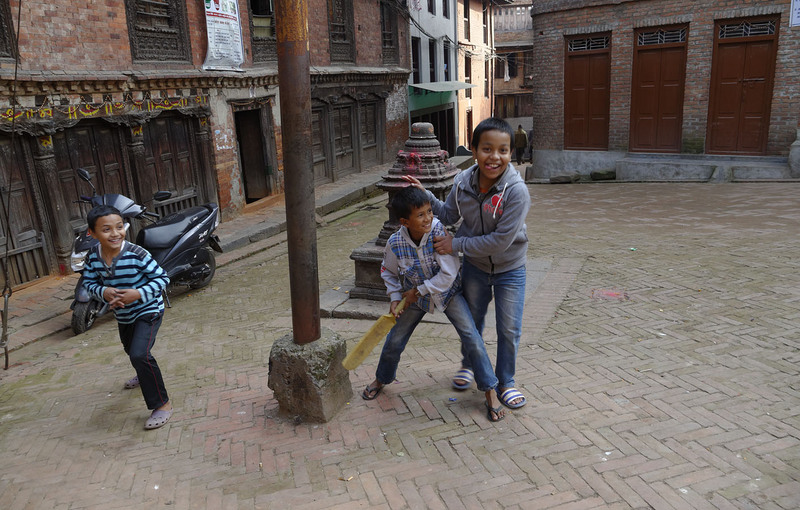 I do miss the people of Bhaktapur and their ready smiles and cheerful approach to the difficulties life sends their way. 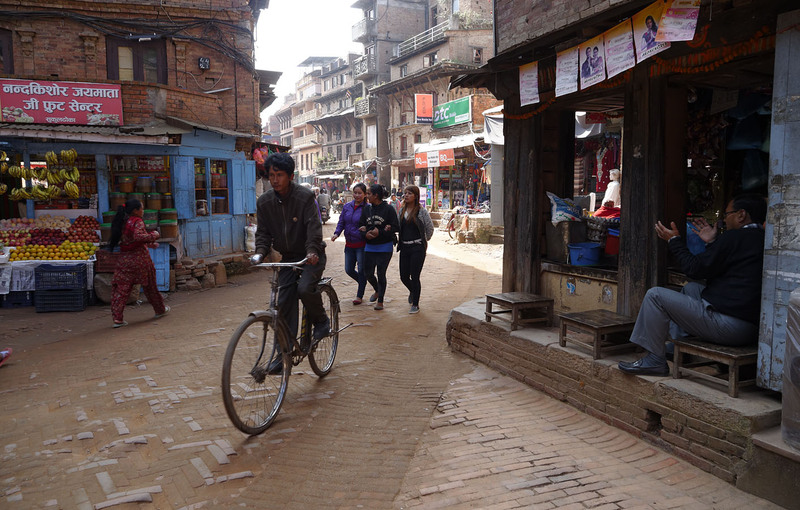 I have always regarded the social impacts of traffic as being the most important reasons to adopt the carfree city, and Bhaktapur is itself under threat from this cause, mainly from soaring motorcycle usage. 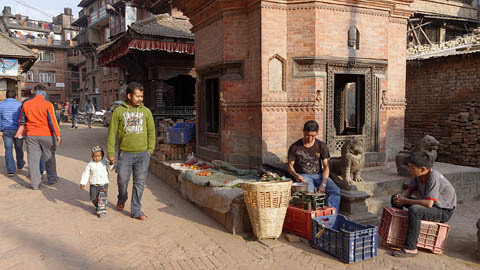 Bhaktapur is also an excellent model for a sustainable way of life. It is certainly not perfect, but per-capita consumption of non-renewable resources is low by any measure, and agricultural practices are generally more sustainable than the intensive chemical farming of the West. 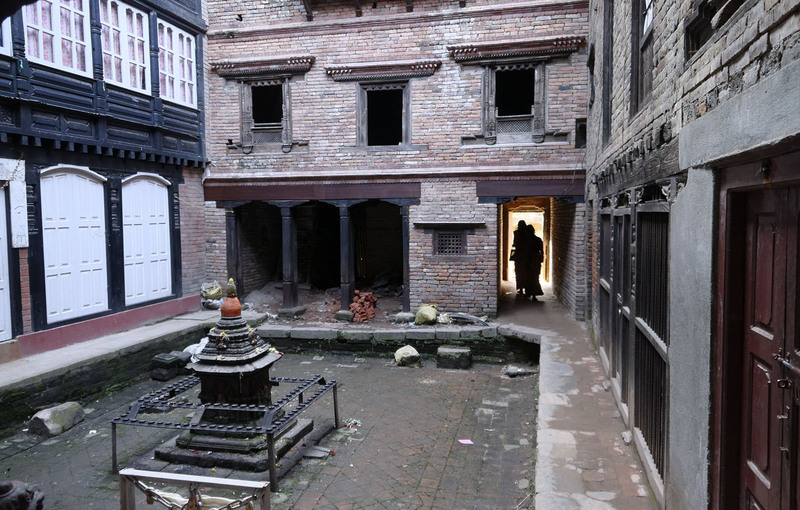 The form of the city itself is, by my reckoning, nearly ideal, with narrow streets, four-story buildings, and in many cases interior courtyards. This arrangement in fact resembles the one proposed in Carfree Cities and can be found, in varied forms, in most of the medieval cities of the world that have survived to the present day. I look forward to the day I will be able to return to Nepal. There are reasons that this remarkable nation is so popular with serious travellers. 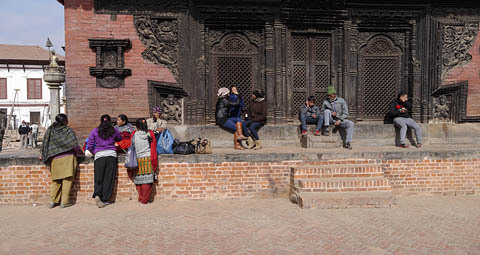 I wish Nepal and the Nepalese a heartfelt "namaste." It has now been ten years since the neighbor boy, driving far too fast on a narrow country road, smashed into my parents' stopped Prius and effectively ended their lives. They both lived three more years and died just 16 days apart, but their lives essentially ended with the crash. My mother was institutionalized on a ventilator for the remainder of her life, which was spent mostly in bed. Drugs administered to her in the first weeks of her hospitalization also damaged her brain, so she never read again, something that had been one of her great passions. My father already suffered from serious dementia at the time of the crash. Up until that point he had been cared for by my mother. After the crash, he was cared for by strangers except for a few months when I was able to bring him home, before his dementia worsened to the point where he had to move into assisted living and finally into the same nursing home as my mother. It is so that some of their caregivers were wonderful people and did their best to give them a decent final few years of life, but circumstances were against them. I would like once again to thank them for their care and compassion. The death of Indira Bijukchhe again brought the terrible consequences of bad vehicular crashes into sharp focus for me, and I was reminded anew of the awful pain and suffering they cause, not only to those involved directly in the crash but to their loved ones. This toll will probably never disappear entirely, but it simply cannot be tolerated on the scale that it occurs today. Millions of people are killed or maimed every year on the world's roads, and millions more die of the effects of air pollution, much of which can be traced, directly or indirectly, to motor vehicle use. Given that we perfected rail transport decades before the first primitive Mercedes Benz appeared on the streets, one can only ask why this slaughter is tolerated. Trains do occasionally crash, but they are about an order of magnitude safer than cars, and their environmental impacts are comparably smaller as well. I think a large part of the answer lies in corporate interests. In the United States, we have a roughly 90-year history of the "road gang" (see Stephen B. Goddard's Getting There: The Epic Struggle Between Road and Rail in the American Century) manipulating public perceptions and influencing public policy in a direction that made vast fortunes for the various highway interests while destroying huge swathes of American cities and killing millions of Americans. As with so many aspects of American life, it is time for common sense and the common good to seize control over private interests that manipulate the public realm for private profit. Enough is more than enough. Eric Britton at EcoPlan recently encouraged me to write a brief retrospective on the time since Carfree Cities was published in early 2000, about 6000 days ago. What has happened since then, and where are we now? How does the book stand up after 16 years? The book enjoyed surprising early success and went on to a second printing two years later. The first edition has been sold out for years, and only a few copies of the paperback edition are still available. Quite a lot of this success was due, I think, to a relatively extensive North America promotional tour that lasted about two months, involved about two dozen talks, and garnered considerable media attention, especially in Canada. The carfree idea is, of course, as old as cities, except that nobody noticed until the first cars appeared, an event that generated considerable resistance to their intrusion. Ultimately, the road gang prevailed. Streets became the exclusive domain of cars, and many children no longer had anywhere to play. Death in the street became an "accident," for which the pedestrian was usually held responsible. The suburbs became an obvious destination for families, where the impacts of the automobile were not so strongly felt. My generation, the baby-boomers, was really the first American generation that grew up mainly in the suburbs, long before "stranger danger" became standard-issue paranoia. We got around by walking, biking, and sometimes public transport, and so we had a great degree of freedom. This was a time of unprecedented prosperity and almost unrivalled American dominance in every sphere. Having known nothing else, we believed this was a normal state of affairs, and our complacence persisted until the Vietnam war and the gasoline shortages of the 1970s. Most of my generation is still fit enough to drive, so the limitations of an auto-centric society have not yet affected them directly, and most of my generation still don't see anything much wrong the auto-centric suburban model. This is only now starting to change. With the Millennials, the situation is quite different. By the time they came along, the auto-centric model wasn't working very well, and they never had much freedom to get about, whether on foot, by bike, or on public transport. As kids, they were driven almost everywhere they went, and they had to rely on parents for their social contacts. The Millennials are not terribly enthusiastic about cars. Their prospects generally look rather grim, as they appear to be mostly priced out of the suburban dream their parents took for granted. So, they have reason to look towards other urban models. They also find cities more interesting and attractive than earlier generations. If the Millennials decide to turn to carfree cities as a way to solve a host of problems, including social breakdown, economic inefficiency, and damage to the environment, they will find the carfree model ready and waiting. Even in America, it is no longer remarkable for a city to declare some of its streets carfree, sometimes temporarily, sometimes permanently. Today, most European cities have at least a small carfree area, usually downtown, which is often the center of cultural and social life. When the world is ready to take up the carfree concept on a large scale, it will find that the thinking is largely complete. Some technical development, particularly in the matter of freight delivery, will be needed, but the basic concepts already exist, and most have already been prototyped. So, in short, if I were to rewrite Carfree Cities today, there is not much that I would change. My preference for fine-grained, small-scale urban areas has further increased, and I have changed my mind about street trees (in favor), but otherwise I believe the book stands as it was written in the late 1990s. I only hope that the principles that it espoused will be much more widely applied 6000 days from now. "The curse of urban sprawl: how cities grow, and why this has to change"
The Guardian's Mark Swilling says it is time to stop the sprawl. "The total area covered by the world's cities is set to triple in the next 40 years - eating up farmland and threatening the planet's sustainability. "I have just spent two days in Barcelona, one of the most densely populated urban settlements in the world . . . . Yet despite these high densities, residents of Barcelona will tell you how profoundly livable their city is. Visitors are charmed by the pedestrianised streets that thread their way through a maze of buildings constructed over the centuries - between four and seven storeys high, on narrow streets leading to piazzas where people sit at cafe tables or under shady trees. Many residents walk or cycle to work, and public transport functions very well." "3-Minute Read: Here's What Happened When A Neighborhood Decided To Ban Cars For A Month"
"Paris divided: two-mile highway by Seine goes car-free for six months"
"The morbid and mortal toll of sprawl"
"Cubic and Mastercard study shows impact of New York's car free day"
"The one-day event resulted in an increase of more than 30,000 passengers than the season's daily average on the MTA subway, while public data for other services like bike share also showed a statistically significant increase in usage. "Car-free Belgium: why can't Brussels match Ghent's pedestrianised vision?" In Ghent, 72% of people favour plans to expand the pedestrian zone by 15 hectares, and another 17% are neutral. In Brussels, renowned for terrible traffic, the key failure was that, despite the support of 85% of local shopkeepers for carfree spaces, some 92% said the plans had been badly implemented. This is a very typical failure. "Burying a 1950s Planning Disaster"
"Will we ever get a truly car-free city?" In Carfree Times #28 (2002), I reported on a chance encounter in Paris with an under-test moving walkway that ran at speeds of up to 9 km/hr, with twice that speed in the realm of possibility. (See: "Moving Walkway at Montparnasse") The system was eventually removed due to problems with the technology but most especially because users often failed to make the speed transition properly and fell down. People did not understand, despite clear signage, that they simply must grasp the handrail during the acceleration phase or they would be very likely to suffer a fall. I saw two people fall during a quarter of an hour observing the Paris system. "Could moving walkways be the key to car-free cities of the future?" "Fast moving walkways could move 7,000 people per hour"
"Moving walkway networks would be an efficient transport option for car-free cities"
A little digging revealed that the ThyssenKrupp Express Walkway uses a different technology, and it appears that the acceleration is lower, which may have solved the problem of falls. The system is apparently not yet perfected - it is said to be noisy and unreliable. Still, as I said to the engineers in Paris, if the system could be made to work, it would make the carfree city a good deal easier to attain. They clearly already understood this. "Scientists 'too frightened' to tell truth on climate impacts"
Please watch our 53-minute film, "Recovering from Disruption," which gives concise proposals to address the major climate threats. "Forget Paris, Scientists Say 'Radical Change' Only Way to Stay Below 2 Degrees"
"Unified Against Trump Threat, World Vows To Push Ahead on Climate Action"
"Canada will tax carbon emissions to meet Paris climate agreement targets"
"Why Morocco is leading the charge against climate change"
Morocco is a developing nation that is preparing to lead the rest of the world into a sustainable future. "In 2014 the country opened the largest wind farm in Africa, valued at $1.4 billion, in the southwest near the city of Tarfaya. Then, in early 2016, it switched on the first facility of the world's largest concentrated solar plant, Noor-1, on the fringe of the Sahara desert. When completed in 2018, it will power one million homes and make Morocco a solar superpower. "And while the country is still heavily reliant on energy imports (90 percent in 2013, according to the World Bank), it plans to generate 40 percent of its energy from renewables by 2020. "Following this road has led to Morocco hosting the UN's annual summit on climate change, COP22, in Marrakech." "Sarkozy proposes carbon tax on US goods if Trump scraps Paris climate pact"
"Nepal Is Showing the Way on Climate Change"
"'The Mother of All Risks': Insurance Giants Call on G20 to Stop Bankrolling Fossil Fuels"
"Oceans act as a 'heat sink': No global warming 'hiatus'"
"Ground beneath our feet is poised to make global warming much worse, scientists find"
"Sea ice hits record lows at both poles. What does it mean?" Consider reading A Farewell to Ice. It's reviewed by the Guardian here. "Arctic sea ice hits second-lowest extent in satellite record"
"Greenland's huge annual ice loss is even worse than thought"
"The huge annual losses of ice from the Greenland cap are even worse than thought, according to new research which also shows that the melt is not a short-term blip but a long-term trend. "West Antarctic Ice Shelf Breaking Up From the Inside Out"
"Arctic ice melt could trigger uncontrollable climate change at global level"
"Human-caused climate change has been happening for a lot longer than we thought, scientists say"
"Feds get out of the way of communities that want to design safer, more complete streets"
"The FHWA finalized new street design guidelines that scrap the bulk of the criteria that local communities and states must adhere to when building or reconstructing certain roads - especially those with speed limits under 50 mph. Of 13 current design criteria for certain roads under 50 mph, 11 criteria have been scrapped, because, in FHWA's words, they have 'minimal influence on the safety or operation on our urban streets.'" "The world's worst traffic: can Jakarta find an alternative to the car?" Jakarta, population 30 million, is the largest city in the world that does not have a metro. When I was last there, more than 25 years ago, traffic was already awful. "The government is allowing low-density development outside the city, and the wider metro area is spreading. That makes it difficult for public transport because there isn't the coverage. We need high density development where your first option is walking or cycling, and for longer journeys you can use the bus or metro. "Attracted by the air-conditioning and the status, many of the 3.5 million people who commute into the hot and humid Indonesian capital come by car. With four hours in traffic not unusual, Jakarta is searching for solutions." "The End of Public Transit?" "Cities such as New York and San Francisco have extensive public-transportation systems that carry millions of residents by bus, train, boat, and light rail. But in recent years, there's been an expanding fleet of private vehicles too: Lyft, Uber, Juno, Uber Pool, and the Google Bus, to name a few. These offerings give commuters more choices, but may also undermine the public services available. 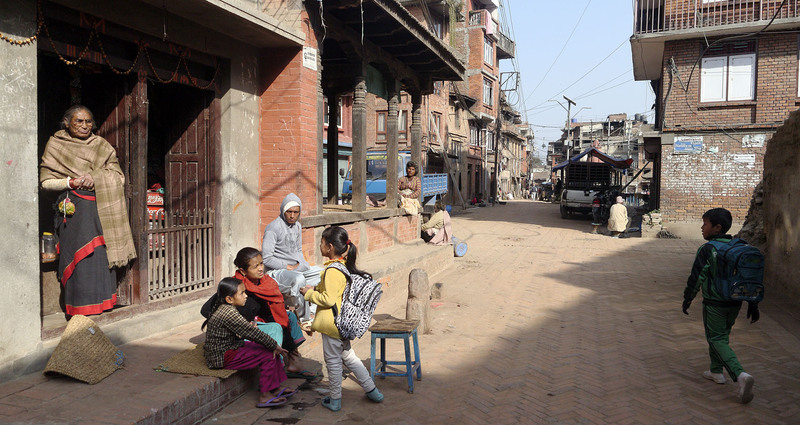 They raise fundamental questions about the future of how people will get around cities." There can be no question but that this poses a serious threat to urban public transport as we know it. The proliferation of millions of additional private vehicles will damage the livability of cities and the quality of the environment. Bus service in New Jersey, where I am staying for the moment, is worse than at any time I can recall. There is no one thing that's wrong - it's everything all at once. I confess, in the face of this difficulty, to sometimes using Uber and Lyft myself. "Why We Don't Drive In Los Angeles: LAist Readers React"
"D66: De snorfiets moet de wereld uit [Doing away with the scooter]"
"Half of injuries treated at SF General Hospital are from traffic collisions"
"Undercover bike cops launch 'best ever' cycle safety scheme in Birmingham"
"Commuters Reduce Their Crash Risk by More Than 90 Percent When Taking Public Transit Instead of Driving"
"Car-Free Bridges: Are They the Future?" "On yer bike! Cyclists take most comfortable route over quickest"
"Bike jams and unwritten rules: a day with Amsterdam's new 'bicycle mayor'"
"Cycle lanes don't cause traffic jams: they're part of the solution"
"Air Pollution in Bolivia's La Paz Falls by 72% on Car-Free Day"
"Transport and climate: rail is the undisputed Number One"
"How the FRA is Regulating Passenger Rail Out of Existence"
"The Tallinn experiment: what happens when a city makes public transport free?" "92% of the world's population exposed to unsafe levels of air pollution"
"De schone bus komt er aan [The clean bus is coming]"
Electrically-propelled buses are becoming much more common these days, and some of them simply have large enough batteries to run the full length of a route without the need for en-route recharging. See: "Amsterdam to replace diesel buses with electric vehicles"
"Agrichemicals and ever more intensive farming will not feed the world"
"America's road trip: will the US ever kick the car habit?" "This Country Just Unveiled a Hydrogen-Powered Passenger Train"
"China's first suspension railway completes test run"
The next issue of Carfree Times is scheduled for February/March 2017. E-mail announcements of new issues of Carfree Times are mailed to approximately 750 subscribers. A rough estimate of first-year circulation for each new issue is 5000. All the issues ever published are still being read. Carfree.com as a whole will have served approximately 1.5 million pages and 100 GB of files in 2016.